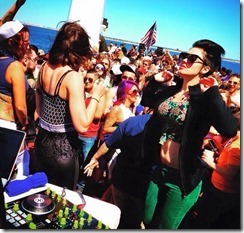 The FREEDOM Boat Cruise is THE signature event of Memorial Day Weekend, and it happens on Saturday May 28, If you only do ONE thing during the weekend, this is IT. Grab your party passes or Freedom tickets online. Leaving from the MacMillan Pier in Provincetown, we set sail for a few hours of fun at sea! Enjoy the Cape Cod coast line with friends and partners while having drinks and dancing to DJs Reece and Jamila Afrika. The music is spread out between FOUR floors of both outdoor decks and indoor space, giving you options of fun in the sun or partying under the roof. You can party with a raucous crowd, sit and chat over a drink or two, or break away and enjoy the coastline with that SO. We’ve also had live performers and guests in the past, so you never know what special treats we have in store!